Today, one of our own needs you all to become pro-active. Last week Robert Stokely sent an email out to the blogosphere. Many of us know and love the Stokely family. The Stokely family has already given much to America. Robert and Retta have already lived every parent’s worse nightmare. Please read Robert’s email below. I need you all to make a few simple phone calls. That – and pray. Please, do this – for Abbey. Thank you. Abbey Stokely was bitten by a tick about 20 months ago. We have been to doctors – the best we can find and she is very sick to this day and I fear she may even die. Yesterday, as a home health nurse came to treat her under the orders of an infectious disease doctor, she suddenly collapsed, stopped breathing and then responded again. 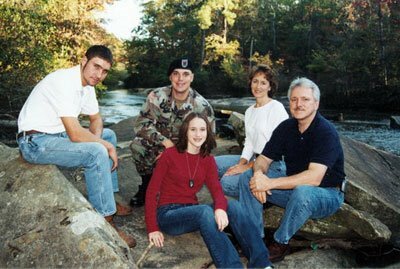 I buried a son, SGT Mike Stokley KIA 16 AUG Yusufiyah Iraq and that nearly did it for me. I don’t think I can bury a daughter, much less I know my wife Retta can’t, for like Mike and I were best friends, Retta and Abbey are the closet mother / daughter I have ever known, and on top of that, they have the closet friendship I have ever seen in my life. The other day, Abbey became so ill and fatigued at school that a friend had to bring her home from school. We, like many other families, are desparate. We nearly lost Abbey in a car wreck five months after Mike died when she and I were struck in her door, sheering it away, by another car running a stop sign. We rolled and then flipped end over end for 180 feet. We spent 18 months gettng Abbey well from that wreck. It was during that recovery time that Abbey was bitten by the tick. Since then she has had to endure something no emerging teenager wants – to have your life taken away and unable to be with your friends. Going to church is a struggle, yet her faith and committment to God leads her to save up her strength to go to church for an hour. She went to school half days, not even going other days. Amazingly, she maintained the high straight A average she has had everyday of her entire school career, and moved from 15th in her class to 4th (and she is in a very competetive 2010 class). We understood and accepted what we were in for when Mike went to Iraq. Yet, his death continues to be a heart break to us every day. While other thirteen year old girls might have attended their first funeral to bury a grandparent, Abbey attended her first to bury a treasured and loved brother in a most public setting, TV cameras and Reporters in her face at the State Capitol prayer service, and then again as over a thousand attended Mike’s funeral. Instead of a simple graveside service and prayer to get through for a grandparent, Abbey said goodbye to her brother to the report of a 21 gun salute, watching the flag draping his casket be folded, and then the playing of taps. There are a lot of unknowns about Lyme Disease and a lot of “blowing off” of patients like Abbey and our family by the medical community. Some doctors have even had their license taken away or suspended because traditioanl medical community views tend to discount Lyme even exists in many states or that the regimen of treatment is two weeks of an anitbiotic and the patient is cured, and if not, they are depressed and need a psychiatrist. If what I describe above is not enough for Abbey to go through from age 13 – to 16, she has had to endure going through every known medical test and being told we don’t know what you have, but it is not Lyme Disease because Lyme does not exist in GA and you are just depressed because of what has happened in your life. Such is how it goes for many others like Abbey Stokely – they are blamed for not getting better and told there is nothing wrong with them. Abbey Stokely wants to get better, she wants to live a full life, and she wants to be happy. Yet, in the face of the the physical setback of Lyme Disease and only able to go to school half days, some days not at all, she carried a full advanced placement high school load, elected to be the President of her Student Government, doing homework on weekends when her friends are out having fun so she can maintain her lifelong high straight A average. She is in a very competetive academic class of 2010 at her high school and has managed to achieve being ranked 4th in her class. She continues a strong faith in God even given what has befallen her, continuing to read and study her bible and carry on a committed prayer life. She is respectful and considerate of the needs of others even to the point the other day when she was rear-ended by another driver, and hurt again, she was more worried about how they were than her own self, and now worries if the other driver will get in much trouble with their parents and insurance company. She is chaste and would not dare consider a drink or illegal drug. She saves her allowance for college and dreams of being a doctor or doing something to contribute to the betterment of life for others. She was trying to walk several miles a day and build up strength to walk in the three day breast cancer walk and had raised considerable money to donate to the Susan Komen Breast Cancer Foundation by making crafts to sell and holding late night dinners for the staff at her mom’s hospital. Does that sound like someone who is depressed and needs a psychiatrist? Abbey Stokely is sick and could die from Lyme Disease. Now, we as a family need your help. Congress has two bills pending – one in the House and one in the Senate – links above and for a tenth straight year will die if not passed out of Congress in December. We need to look at this disease and study it with an open mind and not take the hasty and closed minded positions as those with a conflict of interest due to ties in the research and pharmacuetical field have. A video “Under Our Skin” which is gripping and compelling to ask questions why not study and learn more rather than misdiagnois or outright ignore the problem. A legitimate question exists why the medical community, including CDC, is not responding and families like us, and people like Abbey, are being left with no answers, even being shunned and blamed with “the problem”. Please help us and the many many others like us around our country. I am not one who shows fear but I am really scarred for my daughter. Please guard your family from ticks, for Lyme Disease, while recognized as a disease in some states on the eastern seaboard from Maryland north, there are many states it exists in great numbers like Georgia but is ignored by health authorities. Remember, thirty years ago no one had heard of Lyme Disease until it was discovered by a doctor who studied the unusual onset of child hood arthritis in large numbrs of children in Lyme Conneticut. While the medical community blames the patient in many cases today, or misdiagnosis the patient altogether, we are very likely to look back one day and ask ourselves as a nation who we could have ignored it for so long and let so many suffer needlessly. Thank you my friends for any contacts you can make and please share this with your friends if you like. My signature on SA says: Every soldier is one of our own. Every soldier’s family is one of our own. One of our own needs you to take the few minutes and call. Thank you.